After you complete your Quicken 2012 budget, you’ll want to review your handiwork. And you perform your review using the Budgets window. If you’ve created several budgets, by the way, you need to use the first unlabeled drop-down list box in the top-left corner of the Budgets window to select the budget you want to review. You can use the second unlabeled drop-down list box in the top-left corner to select a budgeting interval (such as Monthly) and the third unlabeled list box to select the specific period (August 2012, for example). If a careful review of your budget shows things have become, well, rather a mess, click the Budget Actions button and choose the Delete This Budget command. You can then start your work over. After you create your budget, you don’t have to do anything special to save your work. 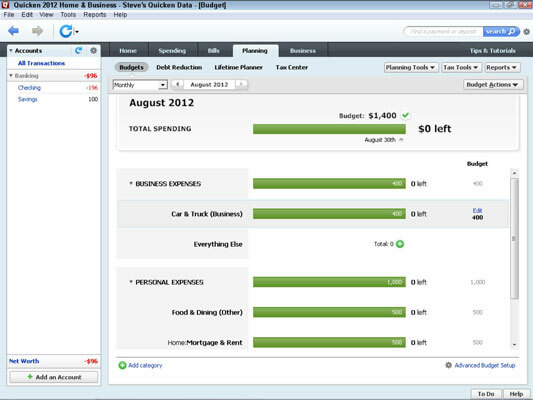 When you create a budget, Quicken automatically saves your work for you. If you want to print a hard copy (computerese for paper) of the budget, choose Reports→Spending→Budget.